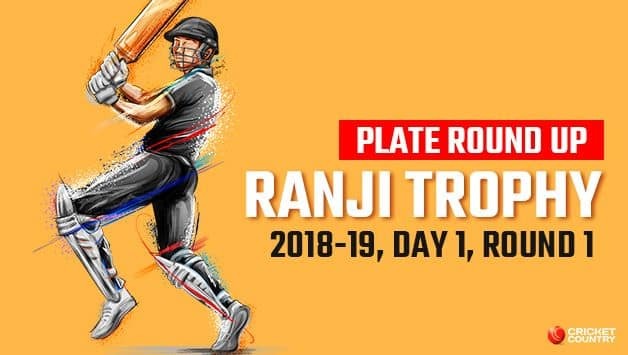 A round-up of the Plate Group matches on day one of the 2018-19 Ranji Trophy. Debutants Uttarakhand made a strong start to their first Ranji season by bowling out Bihar for 60 inside one session in Dehradun, with pace bowler Deepak Dhapola the star with 6/13 in 8.1 overs. By stumps, Uttarakhand led by 141 after fifties to Karanveer Kaushal (91) and Saurabh Rawat (64). 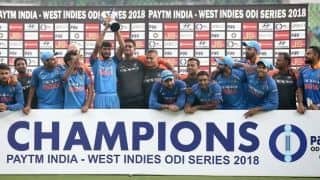 Dhapola vindicated Rajat Bhatia’s decision to field by striking twice in the first over of the match, bowling Vikash Ranjan for 0 and trapping Babul Kumar lbw before he could open his account. Dhapola took five of the first six wickets to fall as Bihar slumped to 36/6 inside 13 overs and then dismissed Samar Quadri to end the innings in 22.1 overs. Two-time Ranji Trophy-winner with Rajasthan, Vineet Saxena, failed in his first match for Uttarakhand when he was out for 7 to Anunay Singh, and then Quadri struck twice in his first two overs. But Kaushal, who this month became the first double-centurion in the Vijay Hazare Trophy’s history, played a brisk innings in the company of Rawat. Kaushal’s debut fifty needed just 47 balls, wth the help of six fours and a six, and he was on course for a maiden century until Pragyan Ojha cut him off on 91 from 135 balls. Kaushal and Rawat put on 117 for the fourth wicket. In Kolkata, an unbeaten 202 from former Delhi cricketer Milind Kumar propped up Sikkim to 299/9 while accounting for nearly 70 percent of the team’s total against Manipur. The start had been woeful for Sikkim as Shelly Shaurya cut them up to 5/15 inside ten overs, but then came a scarcely believable counter-attack from Milind, who hit 29 fours and two sixes, with vital innings from Bipul Sharma (45) and Lee Yong Lepcha (25). This was Milind’s best score in first-class cricket, surpassing his previous high of 119. He put on 107 wth former Punjab and Himachal Pradesh spinner Bipul and 62 with Lepcha. At the Nagaland Cricket Stadium in Soviam, hosts Nagaland dominated Mizoram who lost their last five wickets for 14 runs to be bowled out for 106 in 47.2 overs. At stumps, four wickets down, Nagaland led by 83 runs. Former Delhi left-arm pacer Pawan Suyal became the first wicket-taker for Nagaland in first-class wicket when he had Mizoram captain Mikal Lalremkima caught, fittingly, by Rongsen Jonathan who was the first Nagaland player to play first-class cricket when he turned out for Railways in 2013. Suyal struck again during his first spell to leave Mizoram at 25/2 and then Abrar Kazi, the former Karnataka spinner, tied down the batsmen with a stifling spell that read 16-7-16-4. Further strikes pegged Mizoram back from 92/5 to 106 all out as Imliwati Lemtur grabbed two wickets without a run conceded, including that or former Punjab batsman Taruwar Kohli for 49. There five ducks in Mizoram’s innings. Nitesh Lohchab got Nagaland’s reply off to a good start, hitting eight ours on the way to 45, and there were handy innings from Sedazhalie Rupero (24) and KB Pawan (30). However, the fact that Jonathan was batting on 70 from 64 balls at stumps, with Nagaland 189/4 in 40 overs, means that a seriously big lead can be achieved. In Shillong, hosts Meghalaya found themselves in trouble at 87/6 by stumps after Lakhan Singh and Gurinder Singh combined to bowl out Arunachal Pradesh for 166. A feeble batting card saw only Meghalaya skipper Jason Lamare (45*) and Aditya Singhania (16*) make it to double-digits. Meghalaya ran into early trouble too, slipping to 22/3 in seven overs as Licha Tehi (3/18) and Subhash Sharma (2/30) made inroads. Earlier, Lakhan took the first wicket for Meghalaya in first-class cricket, bowling Techi Doria for 2, and later added two lower-order blows to finish with 3/38. But it was former Punjab and Chhattisgarh allrounder Gurinder who did the real damage, taking 5/50 in 24.3 overs of left-arm spin. His strikes included Samarth Seth, the innings top-scorer with 50, Kshitiz Sharma (30) and Meghalaya captain Kamsha Yangfo. With these blows, the 26-year-old claimed his best figures in first-class cricket and first five-wicket haul.